SolarCity and Vivint said the decision would force them to shut down operations in the state. Update: On Wednesday, SolarCity announced it would halt operations in Nevada. "This is a very difficult decision but Governor Sandoval and his PUC leave us no choice. The people of Nevada have consistently chosen solar, but yesterday their state government decided to end customer choice, damage the state's economy, and jeopardize thousands of jobs," said SolarCity CEO Lyndon Rive. "The PUC has protected NV Energy's monopoly, and everyone else will lose. We have no alternative but to cease Nevada sales and installations, but we will fight this flawed decision on behalf of our Nevada customers and employees." “While the people of Nevada have consistently chosen solar, the state government today decided to take that choice from them, and damage the state’s economy,” said SolarCity CEO Lyndon Rive. It's unclear whether the economics for rooftop solar in Nevada, for both new and built systems, will continue to pencil out, said Cory Honeyman, senior solar analyst at GTM Research. The gradual shift from retail to wholesale rate net metering allows for cost reductions to offset some of the policy change, Honeyman added. But cost reductions alone won’t be able to counter the reform. The full effect of the rule depends on how high the fixed charges are set. NV Energy now has seven days to determine what the new solar fees are going to be based on the PUC’s guidelines. The utility was unable to provide more information at this time. “We are currently reviewing the order to determine its impact on our customers,” said Jennifer Schuricht, spokesperson for NV Energy. In July, NV Energy proposed reducing the net-metering credit by roughly half -- to 5.5 cents per kilowatt-hour from the current 11.6 cents -- to better reflect the cost of serving solar customers. The plan would have established a three-part structure made up of a monthly basic service charge, a demand charge and an energy charge. 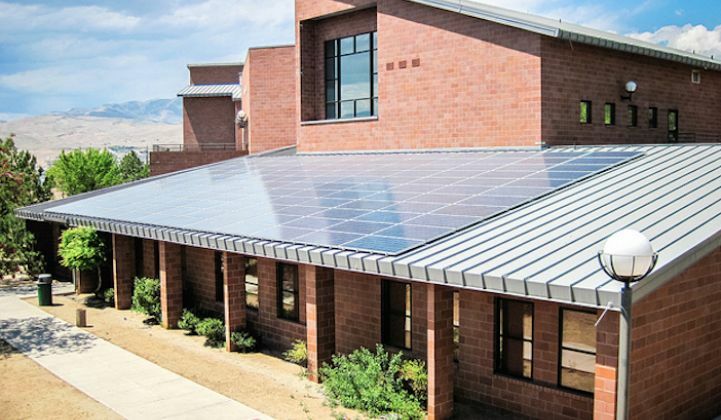 According to The Alliance for Solar Choice (TASC), NV Energy’s proposed rate would amount to a $40 monthly fee for most solar customers, who typically save $11 to $15 per month on their electricity bills, thereby eliminating all savings. The PUC’s vote today dismisses NV Energy’s proposed demand charge. It also creates a time-of-use pricing option that will allow net-metering customers to take advantage of off-peak demand periods. Still, solar companies say the changes will lower net metering compensation to the point where rooftop solar no longer makes economic sense. Earlier this week, the CEOs of SolarCity and Vivint Solar -- the top two residential solar installers in the U.S. -- said they would be forced to halt operations in Nevada if the PUC's proposal passed. Nevada recently jumped to the 10th largest state market for installed residential solar capacity, up from 18th largest at the end of 2014. If the solar industry in the state shuts down, Nevada stands to lose approximately 6,000 jobs. Amid the policy turmoil, SolarCity opened a 13,000-square-foot training center in Las Vegas last month that will house large-scale models of different types of roofs. The facility is intended to train employees from Nevada, Colorado, Texas and Arizona. At publication time, SolarCity had not responded to a request for comment on whether or not the PUC decision would affect the center. Solar advocates made a strong push to keep the existing net-metering policy in place, recognizing the impact on jobs. Earlier this month, solar companies and grassroots organizations submitted more than 31,000 petitions to the PUC asking commissioners not to increase fees or lower compensation for net-metered solar customers. Governor Sandoval distanced himself from the solar policy debate ahead of the PUC vote. "The commission is required by law to provide for energy rate stability and balance the interests of ratepayers with business," he said. "I cannot, and will not, interfere with its deliberations or try to influence decisions issued by the PUC as it meets its statutory obligations." Sunrun alleges that Sandoval’s office has close ties to NV Energy, which led to today’s PUC decision. The company is currently suing the governor for failing to comply with a public records request showing communication between NV Energy employees and lobbyists and Governor Sandoval and his staff, including Nevada PUC Chairman Paul Thomsen. The Nevada PUC decision comes days after Congress approved a five-year extension of the Investment Tax Credit for solar, highlighting the significance of state-level policymaking now that the industry has policy certainty at the federal level. “The key bricks in the foundation for solar are the ITC and stable net-metering policies,” said Lauren Randall, public policy manager at Sunrun. “If politicians in Nevada or any other state take away either brick, the foundation crumbles." The retroactive application of Nevada’s net-metering policy also raises the overall risk profile for customers that have already gone solar.